Two video images are projected. One on a transparent screen that hangs free in space, the other on the wall beside it. Various ‘exotic’ faces are taking it in turns on the right-hand screen. They are apparently speaking or singing to us, although we cannot hear their voices. The images, which originate from satellite-TV stations, do not correspond with the sounds. The original sound that belongs to these images can only be heard now and then, through a amplifier placed on the floor, a few meters from the screen. The rest of the sound consists of music from internet radio channels, and emanates from a megaphone hanging just ‘behind’ the screen. The two sources of sound (the original sound and the recordings from internet radio) alternate with some regularity. By means of an image-processing technique, the mouth of the person that can be seen on the screen is fixed precisely in the centre of the screen. The head is moving, but the mouth remains centred in the middle. The microphone is placed in the beam of the video projector in such a way that it casts a shadow onto the centre of the image. 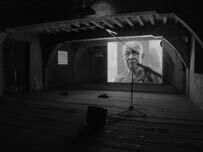 A video projection covering the entire wall shows silvery, grainy images of a mouth whose lip movements exactly follow all the spoken text and song. We are being approached from various sources, but how are we supposed to understand what is being said, sung or shouted here? The languages being spoken are mostly unintelligible. The image and sound material has been manipulated in such a way that we are inevitably tempted to look for connections and meanings. Our perception and certain elements of coincidence make it seem as though, if only we can hold on for long enough, there are moments at which image and sound correspond. However, no clear meanings emerge. In this way, information becomes sound-and-image poetry, and watching and listening turns into pure seeing and hearing.